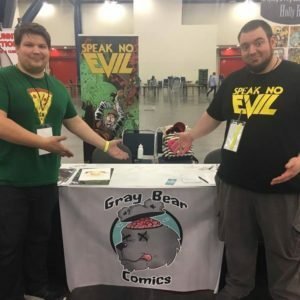 Amazing Houston Comic-Con was a complete success! We sold out of our entire backstock of Speak No Evil and are going back to the printer for more! For those of you who picked up a first print, whether through Kickstarter or a signing/con, THANK YOU SO VERY MUCH! We’re exhilarated that so many of you are enjoying our book. We’re gearing up for the launch of issue two’s Kickstarter on 10/01, and I’m stoked to show you all what we’ve been up to! Samir is absolutely killing it on this issue. His art was already amazing on issue one, but I feel like he’s really bought into the story and is somehow putting even more effort into the pages. It’s crazy how great they look. Chunlin is doing an outstanding job as well. She’s the flat-out best colorist I’ve ever seen! We’ve also got two new variant cover artists for the issue two Kickstarter – Holly Randall & James Ferry, both of whom are absolutely incredible. Lastly, we’ve been getting some reviews of issue one and they’ve been very positive! I’ve added a menu header with links if you’d like to check them out! Overall, we’re both so happy that Speak No Evil is being well received, and we’re excited for the future. Check back soon for more updates!